The Sandbox is the place to build your dreams. The place to practice your fighting abilities. On 15th July, 2017 it was time to honor the work of our officers and fleet members. The Summer ball took place in a place looking like “10 forward” from the TV show “The Next Generations”. This is due the fact that it’s the 3Oth anniversary of “Star Trek – The Next Generations“. So all gathered to award and promote those who were recommend by the senior officers and/or the admiralty. 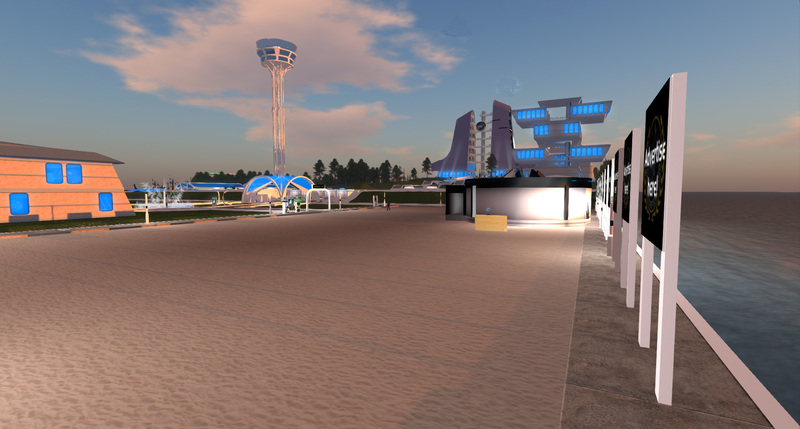 The transporter brought us to a Transport room near 10Forward, and the walkway lead the way to the event location. In front of the window there was a stage with the speakers desk and stands. On teach side of the stage there were posters with the names of the awarded and promoted officers. In front of stage we had some nice tables and chairs where people can sit and enjoy the event. Behind the tables at the rear of the room we had a bar where some nice drinks where served. 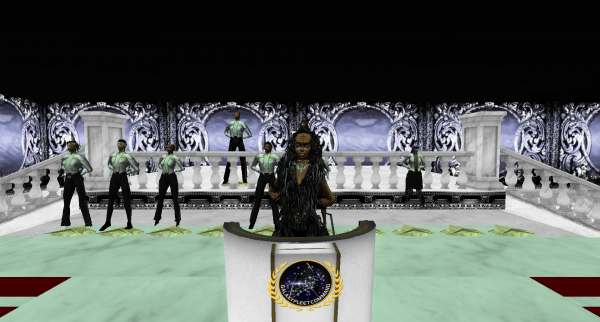 Without a big show or roleplay the ceremony started and ViceFleetAdmiral Mechanique called the officers in groups to the stage to present them with their awards and promotions. The offers where asked to give a small speech to the audience. 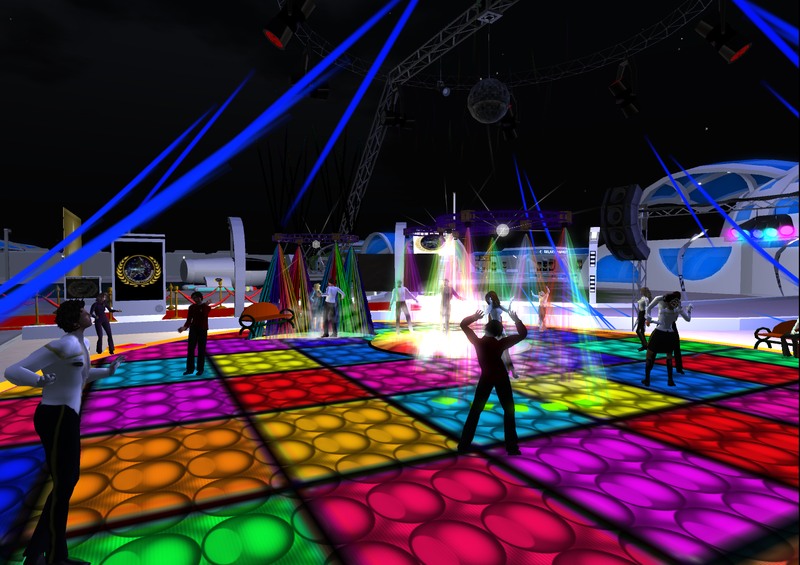 As the official part of the event was over the fun part of it started with some party and dancing. 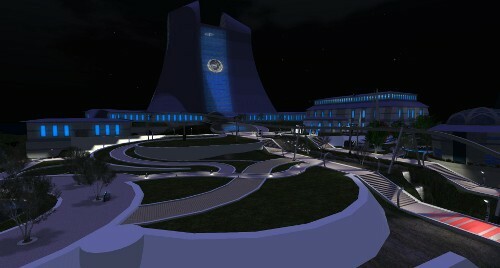 VFADM Mechanique asked all to beam to the Galaxy Beach near the headquarter. At the beach bar we danced and had a nice time to finish the Summer ball of 2017. We all look forward for future events and to the work of all the hard officers supporting the Fleet. GFC Communications would like to thank all who helped to build the ball environment Thomas Aker and Andromeda Quonset. Welcome to the GFC 2017 Winter Ball! On 14th January, 2017 it was again the time of the year to celebrate the hard work of the officers of the fleet and award and promote those who were recommend by the senior officers and/or the admiralty. 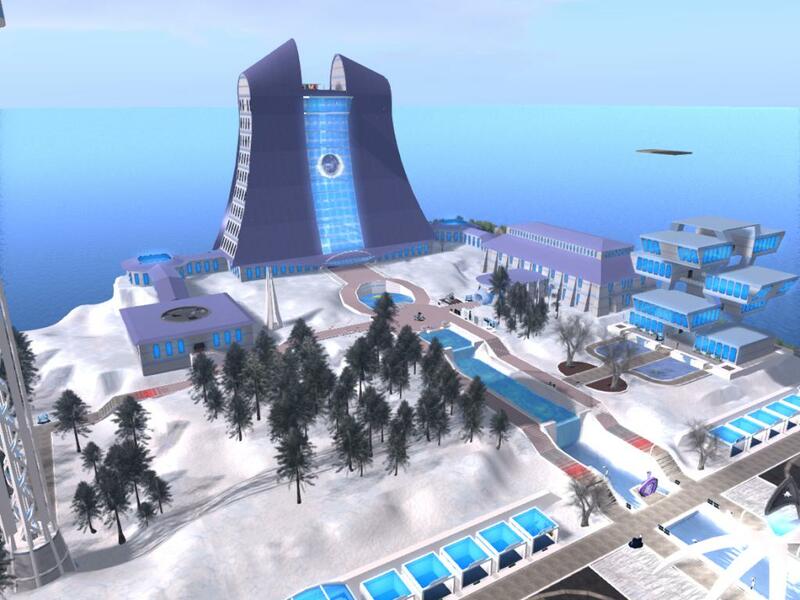 The theme this year for the event was Ice Party – Frozen Times. We gathered at the meeting hall in a mountain area with snow and ice at the tops. Outside the hall a small pre-party took place. When it was time to enter we found ourselves on a marble floor with figures on the wall. At the entrance there was a podest with stairs on each side, leading to the main area of the event room. On one of the sides there is a stage with throne and speak desk. The center was divided into two sections; one with tables and chairs for the dinner and the other for the dance after the ceremony. The first item on the agenda of the ceremony was a role-play about the Snow Fleet (a team of aliens from a cold planet trying to explore other planets to maybe colonize them.) Unfortunately the crew who entered the Galaxy Sim encountered life forms on the planet. The Snow Fleet members wondered if the life forms already met some other aliens trying to overtake the galaxy. Those aliens are the Springers and the Summerians who are very mean, destroying all with their heat and fire. Suddenly a Summerian showed up and tried to melt down the cold and ice galaxy sim to destroy the Snow Fleet and life forms. Snow Fleet crew asked the life forms to help fighting the Summerian . They offered the life forms some snow ball guns. The massive cold from so many snow balls did not leave any chance for the Summerian so he escaped. The snow fleet and the life forms celebrated together and continued the ceremony the life forms just stared to honor the great work of the members of the life forms. At this point I like to thank the actors in the role-play BlueAgate, RoBobby McMillan and Tod ‘Fox’ Vlodovic (tod.vlodovic). After the roleplay, ViceFleetAdmiral Mechanique continued with the ceremony going through the promotions first followed by the different awards. All awarded and or promoted officer came to the stage to receive, and giving a thank you speech. 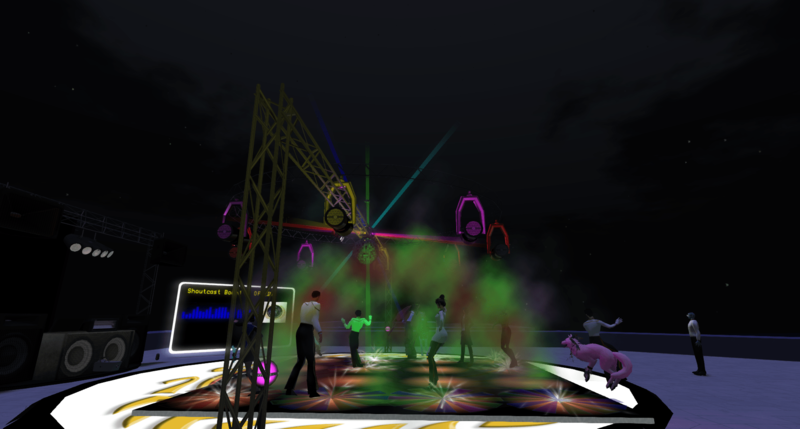 As the official part of the event was over the fun part of it started with some party and dancing. The dance floor was placed behind the tables in front of the stage. GFC Communications would like to thank TimoL McMillan for building the location, and thanks to all who helped to make the Winter Ball such a nice event. 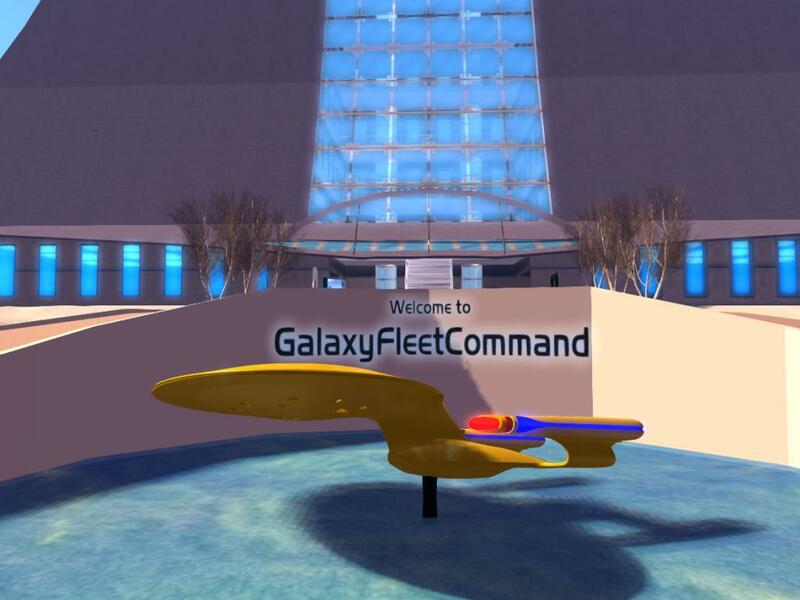 GalaxyFleetCommand once again hosted the GFC Green Expo on the real life earth day of 22nd April, 2016. The committee led by Admiral JD Matova put together a nice agenda including parties, exhibitions, tree planting ceremony, a movie show and a water polo game. 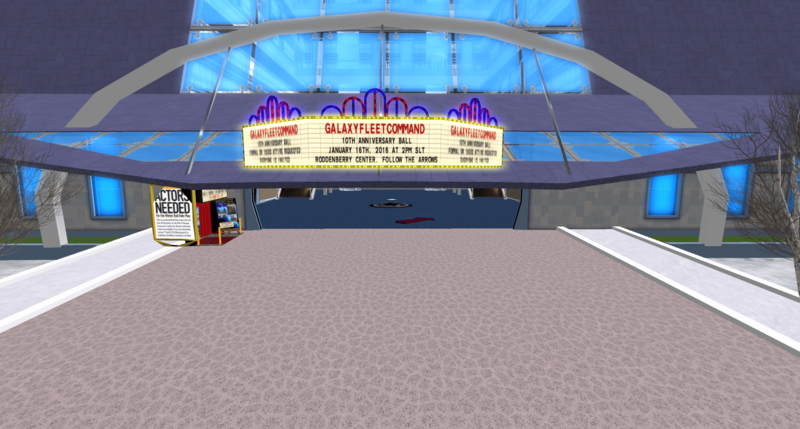 The festivities started at 1pm (SL time) with an opening speech followed by a party at Galaxy Market. Our host and DJ for the party was Ste Mefusula. Galaxy Market was also the location for the divisional exhibition where the divisions of the fleet could present themselves and show what they do for the fleet. One of the vendors at the market had a cinema set up. There the movie HOME was shown. This movie shows how nice our planet is and what we can do to protect it. The protection of the earth is also the theme of an exhibition in the lobby of the Headquarters building, setup by RoBobby McMillan. The images at the wall show simple things each of us can do to help to protect the earth. Things like using less water, use public transport or the bike to go to work, recycle to use less natural resources etc. The second day of the 3-day long Green Expo (Saturday 23rd) was the day of the main ceremony. 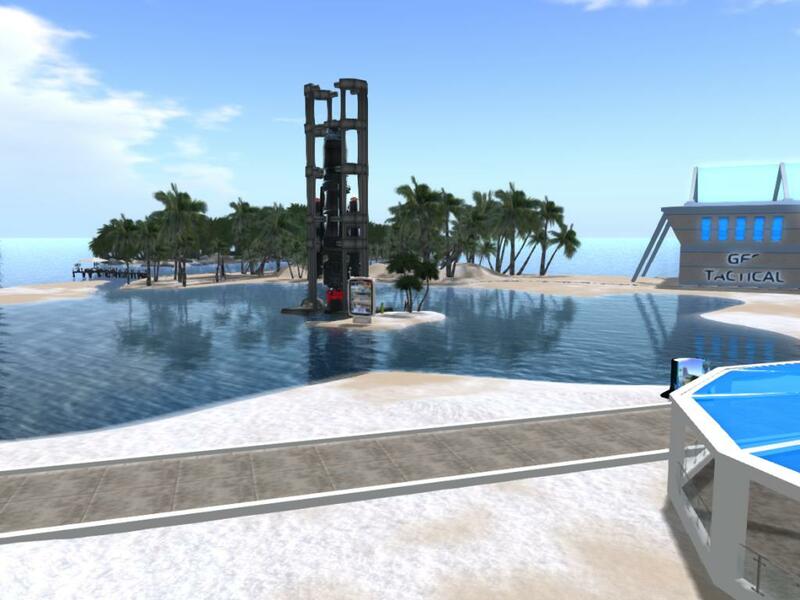 As the RL earth day 2016 as the theme “trees for the earth” we planted a tree in our second life sim. 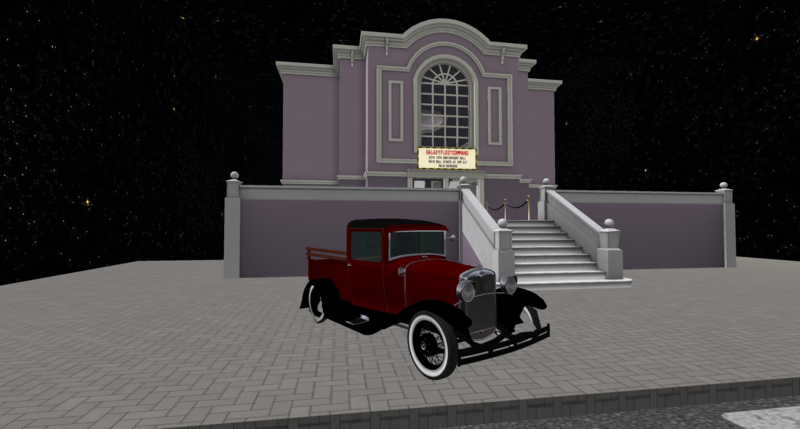 The chosen location was the hill in front of the galaxy auditorium. A growing tree was rezzed there and the growth duration was set to one month – that means in one month the tree growth up to its full size before it shrinks again and starts over to grow again. 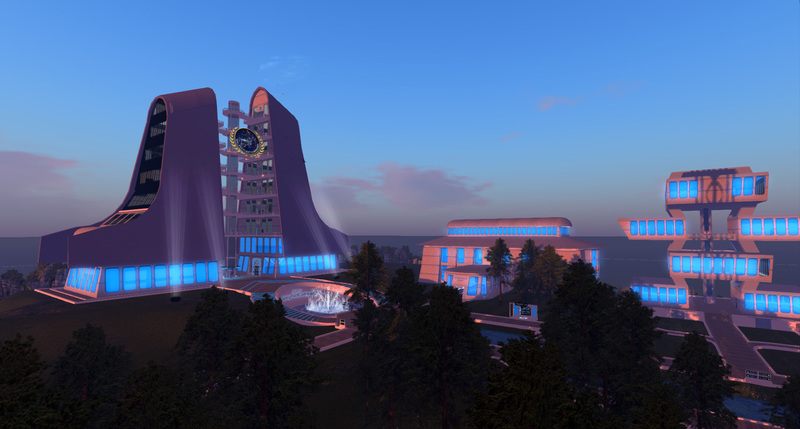 This tree is a virtual reminder to help the RL earth day team to reach their goal to plant 7,8 billion trees by 2020. As the trees are part of the organism that filter CO2 and keep the oxygen for us and all the animals. Without oxygen and without a healthy earth we won’t be able to see the future and see how we go where no one has gone before. Sunday 24th was the final day of the event. FADM Katrina Bixby organised a water polo game. This was a great fun! So the green challenges will continue as there is only one earth – however there are more planets categorized as M-class and no matter what species you are planet earth is worth to be protected. 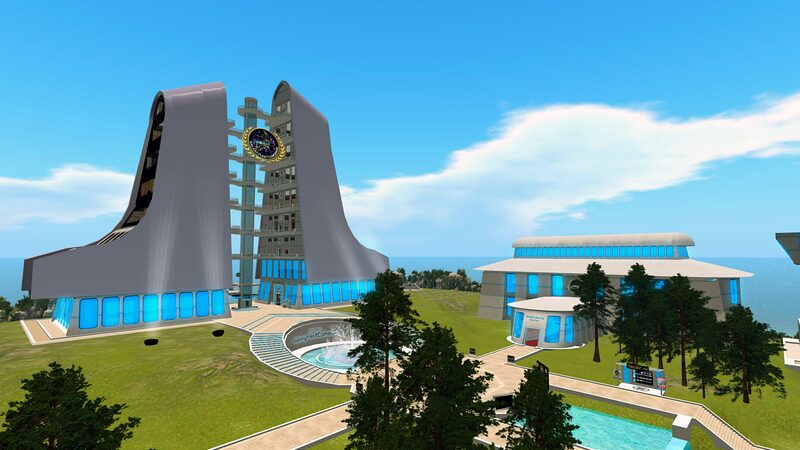 As GalaxyFleetCommand is reducing the sims, we call our home in Second Life, and our second oldest sim is close to its final days, we decided to celebrate all the memories which were gathered over the years. 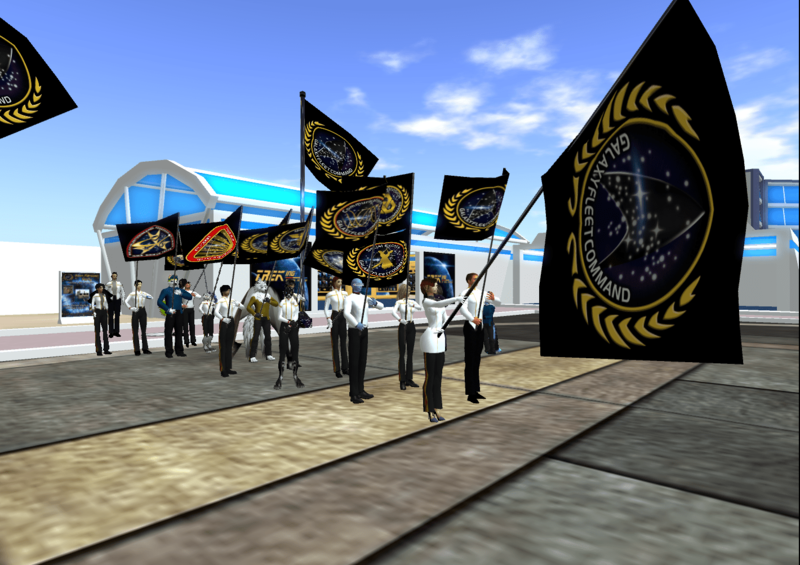 The event started with a parade at Galaxy Market east. All participants where wearing GFC or division flags. Even former members showed up to share the memories. 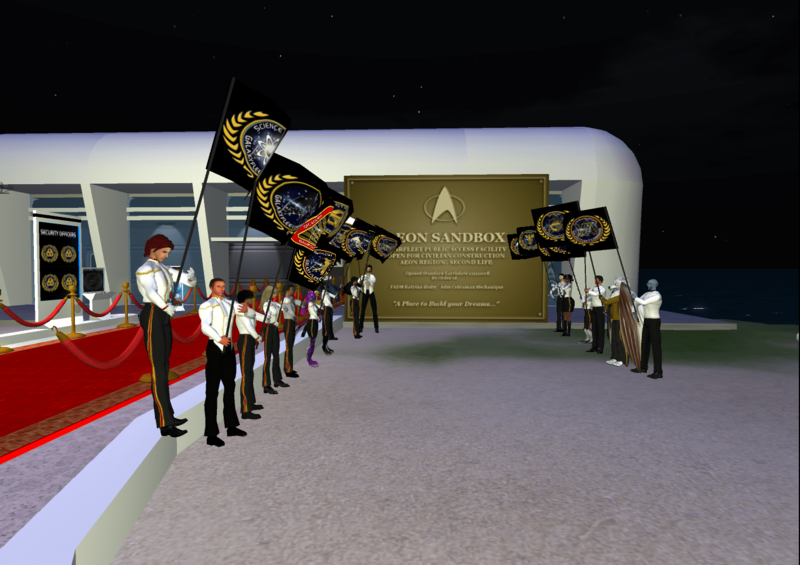 During the parade we were passing the Welcome Plaza, the Aeon Sandbox, Weapons Sandbox and Sandbox Station we reached the Aeon Auditorium. 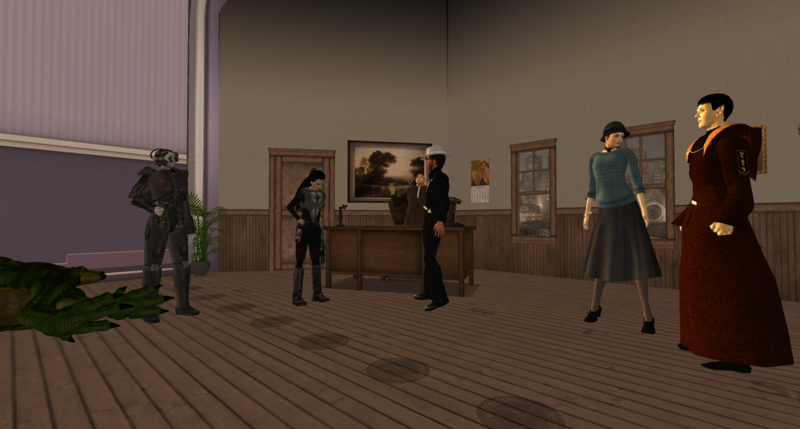 Here we stood in formation before the Aeon plague. 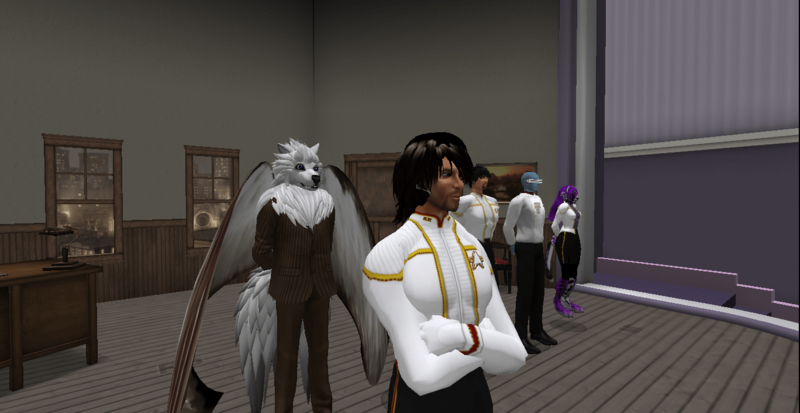 FADM Bixby and ViceFleetAdmiral Mechanique hold some speeches about Aeon and the changes ahead. 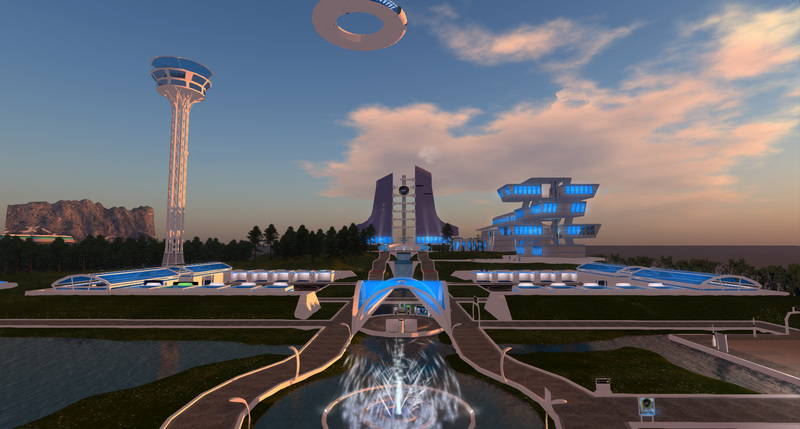 FAdm Bixby underlined, that it always has been the goal to have the sims pay for themselves, but this goal was not reached. 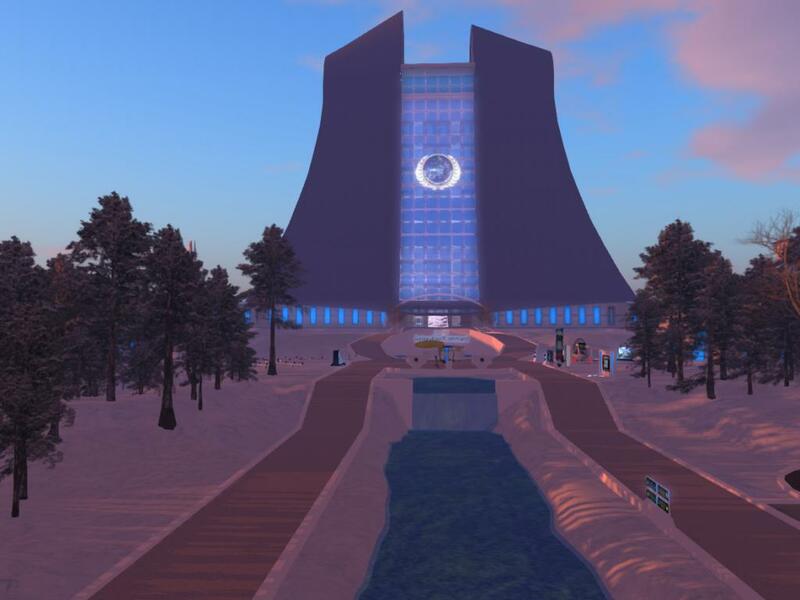 As the numbers of avatars in whole SL are decreasin, the sim owners are happy to keep one sim and expanding to Inworldz. 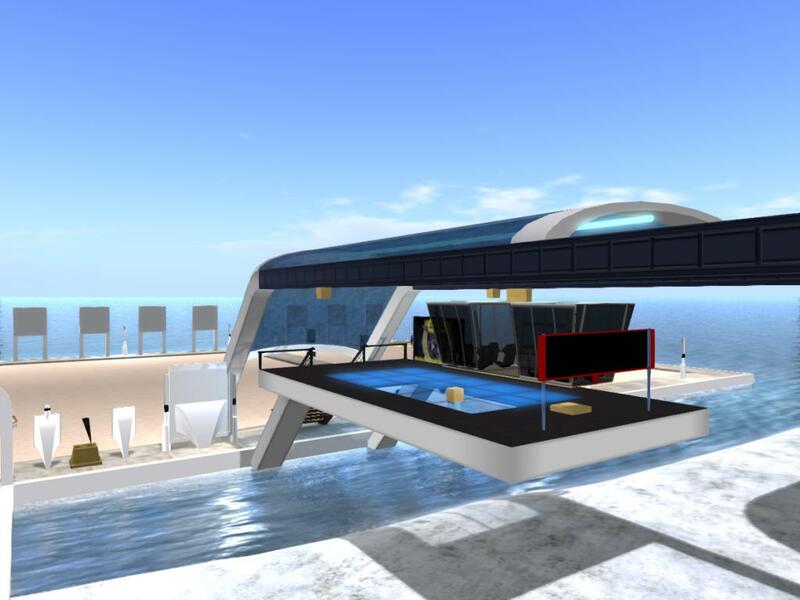 To quote the FADM “it’s like having our home here in Beverly hills, but we have a summer home in Inworldz”. VFADM Mechanique added that Aeon will be hold as we can. The red line will be the Aeon / Galaxy border. 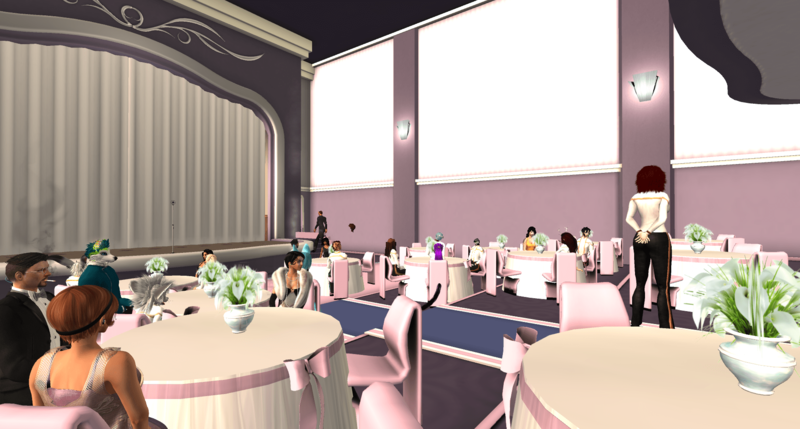 Now we all entered the Aeon Auditorium to hear from our members what their memories are on Aeon. 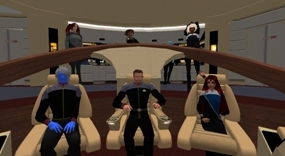 During the ceremony the Senior Admirals Bixby and Mechanique as well as Admiral Quonset, Admiral Matova, Tedra de Arr (Tedra Llewellyn) (Capt of the RP ship USS Menelaus) and Sailor Vasiliev sat on the stage. The first, who said few words, was the Academy Commandant Robobby McMillan. He mentioned that Aeon was a familiar place for him; even this Auditorium has been the site of many, many ‘Town Hall Meetings’, where I led discussions about what would be best for GFC. 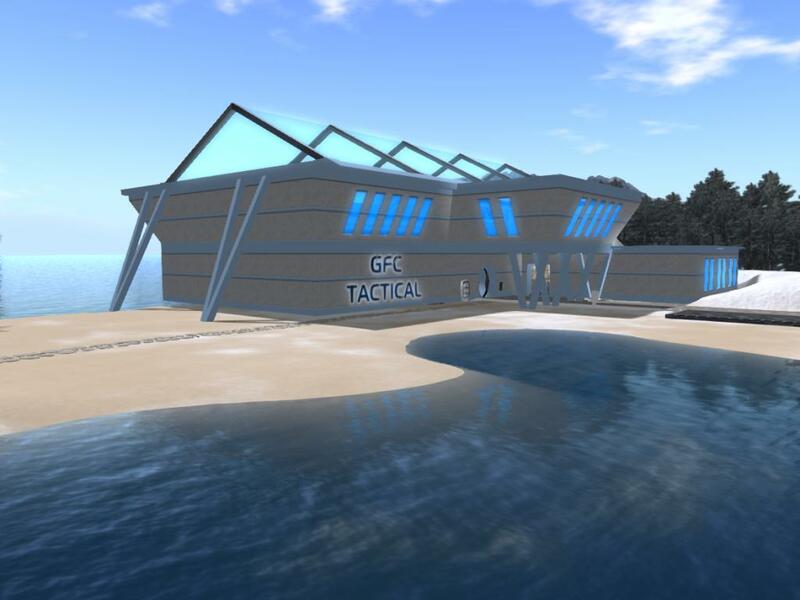 Also the Sandbox which was a place for fun, building and just hang outs not only to the fleet members. While our Academy Air Corps Pilots prepared for the air show rsdworker (rsd58 Congrejo) took the opportunity to say few words. He underlined that he had lot security work in the sandbox to protect the sims and GFC. He is also sure that we all will be remembering Aeon as past and present. Also the Academy Vic Commandant Kieran Braveheart shared his memories apart from sitting on top of signs whilst hearing about the last time Rob was killed. (Robobby McMillan died often in several rps). For Kieran the sandbox was the place he met with the crew that would become the second best crew in GFC history that ran in EU times. There is a huge amount of RP’s he ran in this sim. Therefore he will always remember the amazing times. FADM Katrina Bixby concluded the raw of speeches remembering the many parties, wars, marriages, funerals, promotions, sales, and more which was a lot of fun. 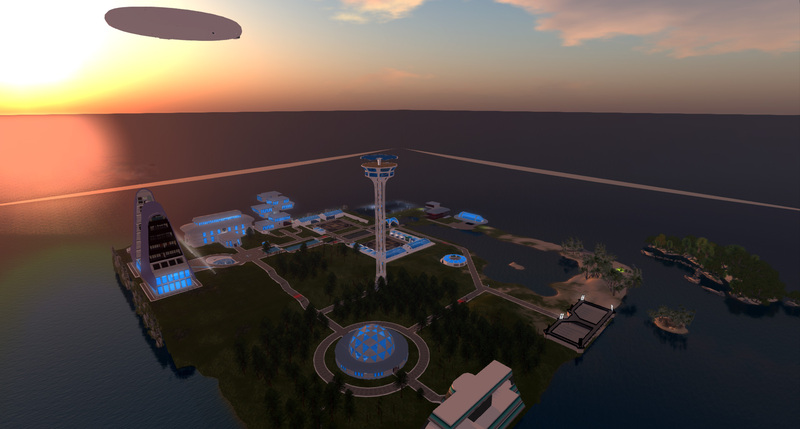 Aeon will be missed but we will continue to have fun in Galaxy and Galaxy II (our planned sim in Inworldz). 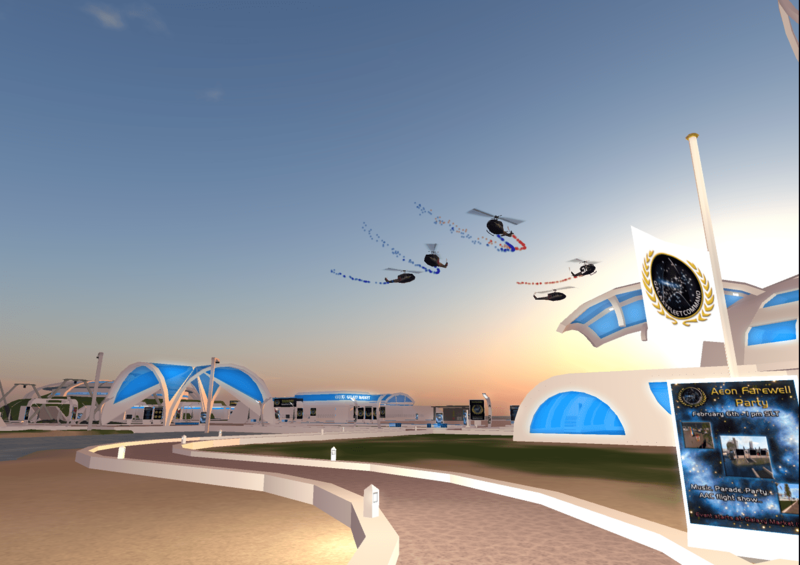 The program of the farewell event continued outside the Auditorium with the Air Show by the AAC pilots. Which performed few fly over’s in old 20th century helicopters. After The party in front of the auditorium. 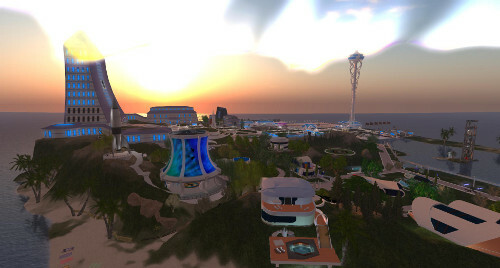 We only can remember this sim and all the experiences connected to it. So I conclude this article with the words. Aeon you will be missed but our memories will stay for ever. On January 16th 2016 GFC celebrated the 10th anniversary Ball. The theme was 1920s. Due to a theme change few weeks before the ball, the organisation team, around Social Events Lead Sereana Westland, had not much time to prepare the ball. 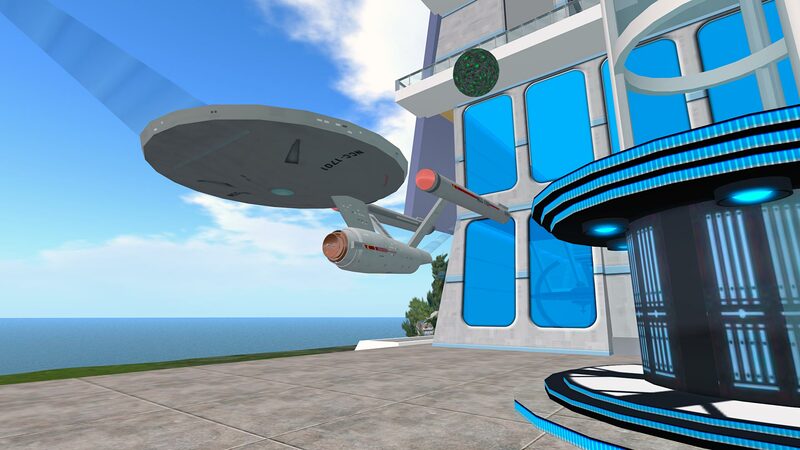 The event took place in the Galaxy Roddenberry Centre. The guest were asked to enter the building via the back entrance from the headquarters building. 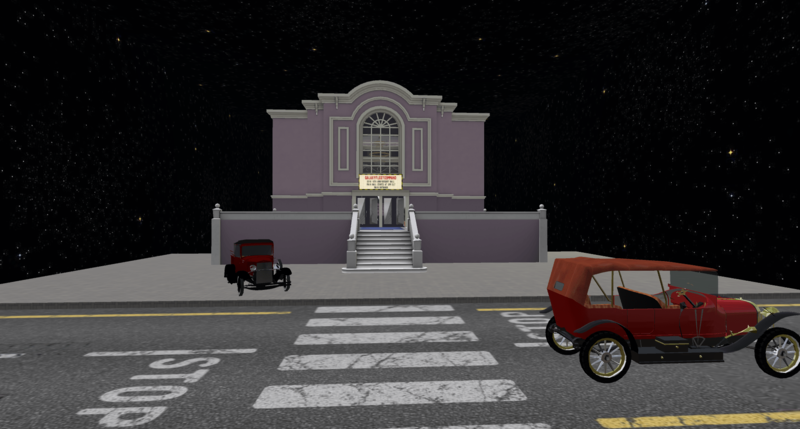 Above the entrance to the HQ, a marquee was placed announcing the ball. On the way to the back entrance, the guests went past the Memorial. Obviously there was a time tunnel between the Memorial and Roddenberry Centre, cause when entering the final building you suddenly found yourself on a street in front of a theater. The tricorders scanned the old cars as well the look and feel confirmed that we were in the 1920’s. There was another set of stairs on the other side of the street that we walked up and you saw another marquee above the entrance to the theater. Following the carpet led you to the entrance halls decorated with flags. Behind the entrance hall, the main hall was decorated with tables. The curtain of the stage was closed. 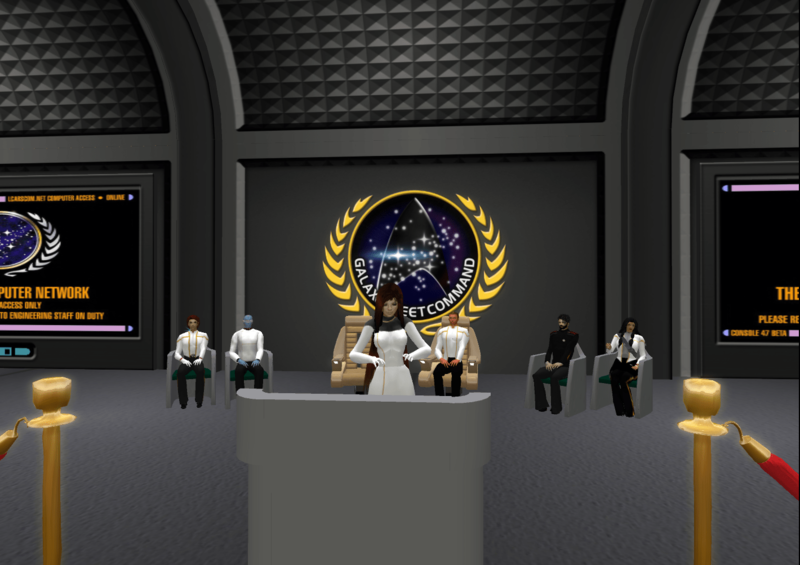 At 2 pm the program started with an introduction by Vice Fleet Admiral Mechanique. Followed by a small rp. It was about the Borg, Vulcan, Cardassian, Klingon, Gorn and others trying to invade the history but in the end a peaceful solution was found and the base for a glorious future as we all know it. After the RP the main part of the ball started the ceremony to present the awards and promotion to the officers and their engagement in the last 6 month. Many members of the fleet were honoured and promised to continue the great work they do. 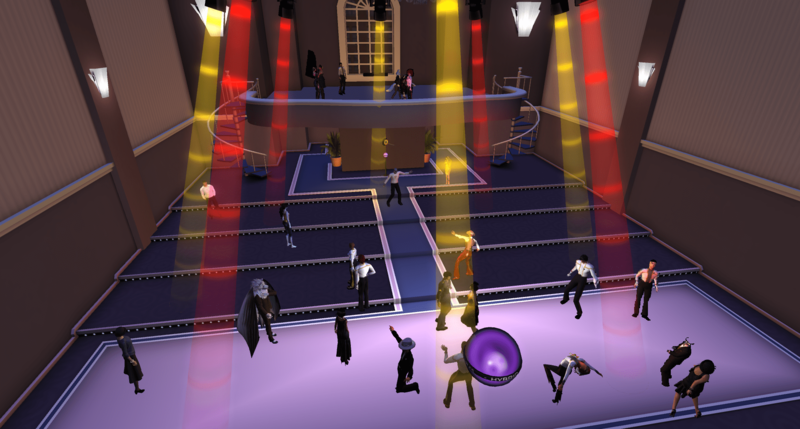 After the main ceremony the dancing party concluded the program of the ball. A photostory about the ball can be found here.